Any color or pattern except those that show evidence of hybridization, such as chocolate, lavender, the Himalayan pattern, or these combinations with white. Short; very dense; well bodied; resilient and firm to touch; no double or wooly coat. The British Shorthair is one of the largest breeds of cat. It is chunky and substantial and the male is much larger than the female. The face is round with full cheeks and the nose is short and broad. The chin is deep and strong. The tip of the chin is in line vertically with the tip of the nose. The ears are small and rounded and set so as to blend with the round contour of the head. The eyes are large and round. The head is set on a short thick neck. The body is cobby with a short level back. The chest is deep and the shoulders are strong. The legs are short and strong with round paws. The tail is thick and of medium length. If you are looking for a cat that will loot your refrigerator and swing dizzily from your chandeliers, then the British Shorthair is not for you. Brits are quiet, even-tempered, undemanding cats with a bit of typical British reserve, particularly when they are first introduced. When they get over their initial shyness, however, they become extreme-ly faithful companions. British Shorthairs tend to show their loyalty to the entire family rather than select one person with whom to bond. British Shorthair breeders describe Brits as cats that like to keep a low profile?sweet and affectionate but not clingy ?in-your-face? type cats. They tend to be independent and if left on their own can usually adapt quite well. 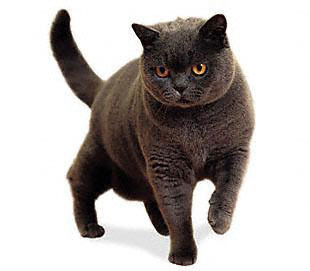 One of the reasons that the British Shorthair became so popular in the last century was because it needed no grooming. The coat is short and dense and the cat can easily look after it itself.